This story has everything: suspense; comedy; romance; danger; violence; the finding and losing and finding again of family; and a genuinely likable hero that we all wish we had in our lives. Huck is a young man who works at a gas station. For this he is mocked repeatedly throughout the story by people who don’t know Huck’s secret. His friends, the people in his little town, know the secret and they try very hard to keep the secret until an indiscreet and greedy neighbor sells Huck’s secret to the press. What’s the secret? Huck has a super power … drum roll please … is it super strength? super speed? ability to read minds? travel through dimensions? change shapes? No. And no. Nothing so mundane. Huck’s super power is … finding things. Now, if Huck employs super strength or super speed or the ability to know what’s going on behind closed doors — which he does repeatedly — he employs them in the pursuit of lost things. A lost husband. A lost dog. A lost brother. A group of school girls kidnapped by terrorists in Nigeria. 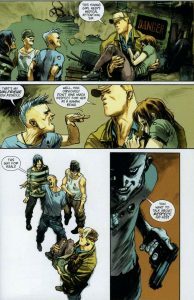 And finally, his own lost mother — this in the company of a super strong man who shows up claiming to be Huck’s brother. He sure knows a lot about Huck and his mother, so simple, kind Huck trusts him. 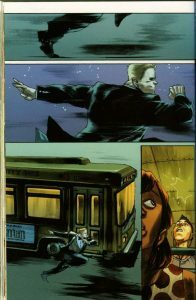 On the trip across the country, Huck stops to tackle various emergencies: rescuing a child in a fire, rounding up escaped circus animals, and in an homage (wittingly or unwittingly) to old-school picture book Make Way for Ducklings by Robert McCloskey, stopping traffic to allow a waddle of ducklings to cross a busy street. When Huck finds his mother, he reveals his character by wondering if his mom will be ashamed that he works at a gas station. His new sibling assumes Huck that Mom will be proud of the man he has become. Little does Huck know his new “brother” is in the employ of a cranky Soviet-era scientist who has spent decades trying to find Huck’s mother. It turns out Huck’s mom has super powers of her own, which the old-school Soviet leaders tried to turn into an army of super soldiers during the Cold war between the U.S. and the U.S.S.R. In fear for her baby, Huck’s mom fled the Soviet Union and settled in the United States in the 1980s. To keep her baby safe, she left him on the steps of an orphanage, where Huck was raised by caregivers to do a good deed every day. 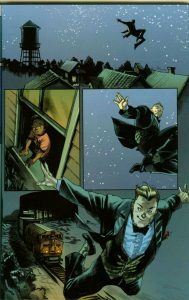 Needless to say, Huck and his mother are betrayed by the new “brother” and find themselves in a creepy science city left over from the Cold War. Can Huck and his mother team up to defeat Dr. Orlov and his human-looking robots? I don’t want to give away the ending to the story — a series consisting of six issues from 2015 — but I will say that the conclusion is not only satisfying but heart-warming. Ew, I used the word heart-warming. 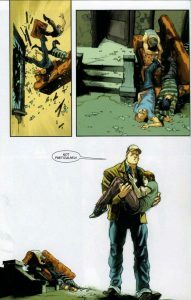 Well, I don’t apologize: I love this story and hope Huck returns in future stories. Before I quit, let me say how much I love the art in this book. Each frame is beautifully drawn and colored to reflect mood and setting. The action is movie-like in what it conveys to your mind, and the facial expressions tell stories outside the story. I want to leave you with one particularly satisfying page turn and story resolution. In the first page, he rescues a daughter who ran away and turned to a life of drugs. Her sleazy boyfriend objects and pulls out a gun. You turn the page to find out what’s going to happen, and the next page pays off big-time. The panel at the bottom of the page — with no borders — is like a music crescendo as we internally cheer for the hero. It’s exactly what we want in a graphic story.